Intersections Introduction: Mediating the Modern: The Magazine Josei in 1920s Japan"
The following three articles address the image of the modern projected to educated Japanese women in the magazine Josei. Josei was published by Puratonsha to promote Club (Kurabu) cosmetics from 1922 to 1928. These were years when 'modern' and the 'modern life' became watchwords of the times. While launched to help sell more of the company's cosmetics, the magazine was not full of advertisements, but rather many articles aimed to give middle and upper middle class women new ideas about what it meant to be modern. The title of the magazine itself was a new term for designating women, indicating its innovative nature. The first article by Kazumi Ishii analyses the innovative nature of the magazine and its legacy, making comparisons with other women's magazines of the same period. The second article by Yasuko Claremont examines the attempts to mould a modern role for Japanese women by a frequent contributor to Josei, Chiba Kameo. Chiba was a prolific literary critic and essayist who promoted women's emancipation and autonomy by introducing feminist models in Western literature. The third paper by Elise Tipton examines some of the most frequently discussed topics in the magazine, that is, chastity, marriage, romantic love and free love. While the articles mainly focus on the innovative and reformist nature of the magazine regarding Japanese women's roles, there is also evidence in the magazine that there was contestation over the modern in 1920s Japan. The contributors to Josei were well known liberal and socialist writers, intellectuals and journalists who represented diverse social and political trends and movements. Their views on women's issues were, in turn, similarly diverse, reflecting the swirl of new ideas, ideologies and social practices that characterised the decade of the 1920s in Japan. Through this examination of Josei, we hope to demonstrate the significance of women's magazines in disseminating new ways of thinking about issues that affected the daily lives of a new generation of educated middle class women. Figure 1. 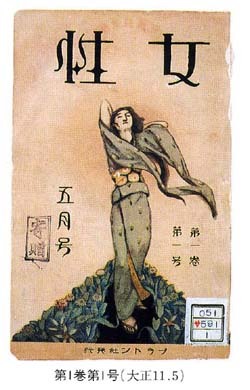 The cover of the inaugural issue of Josei, May 1922 (Source: Tsurumi Shunsuke ed. Zasshi Josei, vol. 1, Tokyo: Nihon Tosho Sentā, 1991). Figure 2. 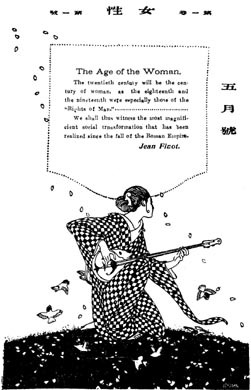 Jean Finot's declaration, 'The Age of Woman', from the inaugural issue of Josei, May 1922 (Source: Tsurumi Shunsuke ed. Zasshi Josei, vol. 1, Tokyo: Nihon Tosho Sentā, 1991). and is best viewed in either Netscape 2 or above, or Explorer 2 or above. From February 2008, this paper has been republished in Intersections: Gender and Sexuality in Asia and the Pacific from the following URL: intersections.anu.edu.au/issue11/intro_issue11.html. HTML last modified: 22 April 2008 1143 by Carolyn Brewer.